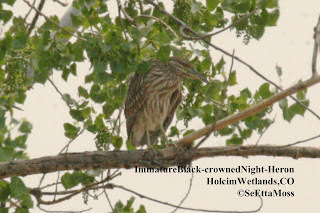 This immature Black-crowned Night-Heron is also in Holcim Wetlands. 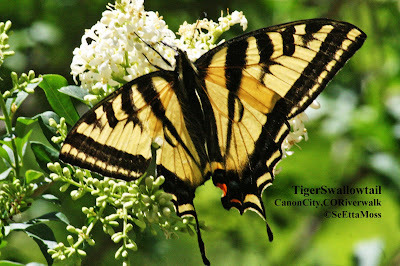 I think it is likely a first spring bird though it's plumage is similar to juvenal plumage. 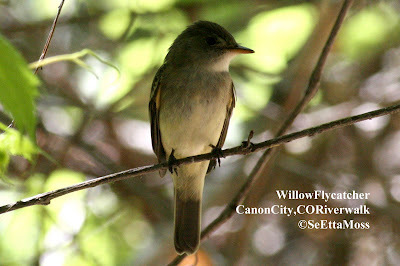 It flies quite well (not like young fledgling), it was out foraging on it's own, and according to Colorado Breeding Bird Atlas I the earliest fledged young recorded in Colorado was on June 21-and it takes young fledglings awhile to become as independent and skilled in flight as this bird. Additionally this birds' iris appear pretty orange which Birds of North America (BNA) online indicates would be consistent with first spring bird--"bright yellow by 20–30 d, orange-chrome by 1 yr, and bright red by 2–3 yr of age". Also it's upper mandible looks "black with greenish olive sides basally" which BNA states is found at age 1. 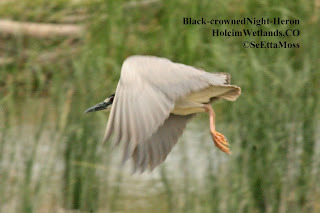 I was really happy to get this pic as one of the adult Black-crowned Night-Herons flew from the Holcim Wetlands to nearby riparian forest to roost. 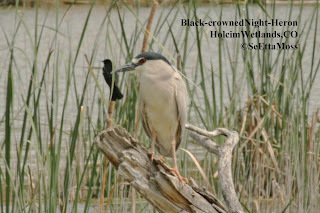 I found this adult Black-crowned Night-Heron at Holcim Wetlands just east of Florence, CO this week. 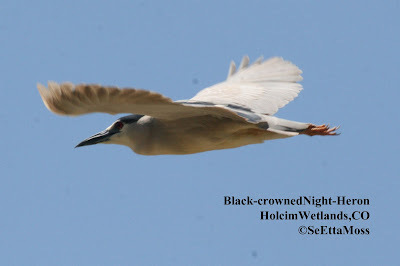 Though I have seen this species in Holcim Wetlands in previous years, there was no indication of breeding nor has there been any indication of their breeding anywhere in Fremont County where this wetlands is located.